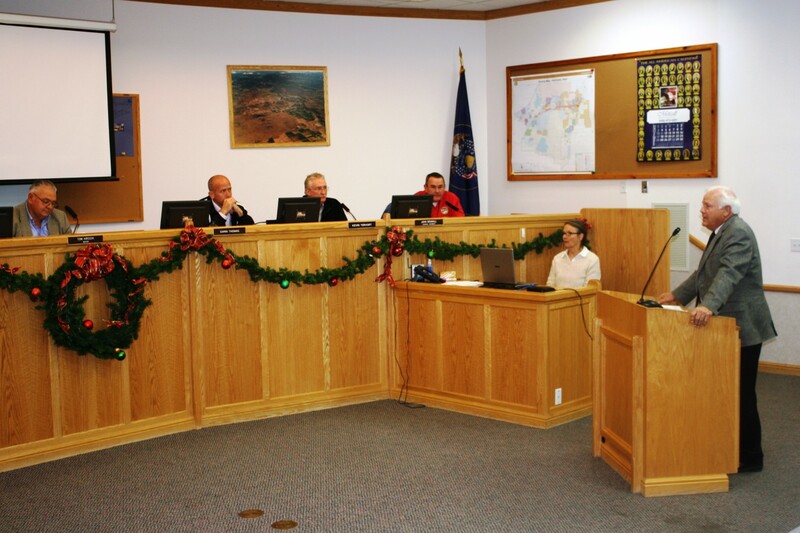 HURRICANE – Washington County Commissioners have started attending city council meetings of the municipalities within the county to present and discuss a proposed 3 percent tax on gasoline designed to provide funds for maintaining local roads. They attended the Hurricane City Council meeting Thursday night to discuss the issue after gaining support for the proposal from the LaVerkin City Council, their first stop, the night before. The commissioners did not gain the City Council’s wholehearted support. One of the challenges of the proposal cited by Commissioner Dennis Drake, who served as spokesman for the commissioners, is that there are several different versions with nothing set in stone. For example, one version suggests half of the new funds from the tax would go to the state and the other half earmarked for local use with another iteration hoping for all the revenue raised to stay local. The last state gas tax passed in 1997 but since then, Drake said, asphalt prices have risen 600 percent making it difficult to maintain roads at the same level. City Councilman and Mayor-elect John Bramall said the 1997 tax promised more allocations to rural counties but his experience driving through rural counties, such as Emery and Duchesne, demonstrate the 1997 tax has not delivered on its promises. Drake said that is what he would like to avoid this time around – the proposal being passed without taking into account its impact on rural counties and without hearing such counties’ concerns. Drake and his fellow commissioners kept bringing up the fact that tourists would ease the burden of the tax a little, which makes the proposal an easier pill to swallow than another rise in property tax. Mayor Tom Hirschi agreed with the commissioners on the property tax, but said citizens are tired of new taxes springing up in economically tenuous times. The only thing Councilman Mike Jensen said he likes about the proposed tax is tourists will help with it. One of the underlying problems Jensen mentioned is that road repairs cost too much, especially with government red tape. For example, Jensen said a $1 million road improvement project could turn into a $1.7 million project after required extras like environmental assessments are tacked on. Drake admitted he does not like the tax either, but that there are no other revenue streams from which to draw and it is time to address the need to properly maintain the county’s roads. Another concern with the tax proposal the city council voiced was that in its current versions, the tax would not apply to diesel or natural gas. Jensen said vehicles powered by these other fuels exact damage on the road as well and their drivers should not be exempt from the tax. Councilwoman Pam Humphries said the gas tax might dissuade drivers from taking vacations and would lead to increased prices on other goods. One alternative Hirschi suggested is cutting from the budget and using the money saved on roads. If the tax doesn’t happen soon locally, eventually the federal and state governments will step in and do it the way they would like, Tervort further said. “Of all the proposals, this one gives us a shared economy,” Drake said, pointing to the fact that in all versions of the proposal a part of the revenue raised from the tax would remain local. Even if Washington County municipalities approve the tax proposal in one of its current versions, the Utah Association of Counties has said all 29 Utah counties must lend their support to the tax for it to become a reality, Myron Lee, manager of the Dixie Metropolitan Planning Organization, said. Analysts say there is a 50-50 chance of the tax being proposed in the next legislative session, mainly because many legislators are up for re-election so they might be resistant to passing such a tax, Lee said. Washington City fuel surcharge, passing on costs to those who create them? I have an idea….Anytime I see a city “crew” working on a road to “FIX IT” there are always 5 guys standing around holding what looks like be a shovel. Do the roads cost so much to fix because you are paying 5 guys to stand around while 1 person actually does any work??? So my idea…lets quit raising taxes and start having less city workers. The private sector has to stay lean and mean to compete all the while the government just take furloughs and reduced pay. Trim the fat cut the waste. I do not agree with a gas tax hike. Especially in rural counties, people depend on their cars to take them long distances for work, school, shopping, etc. Perhaps it’s time the cities and counties start thinking about expanding affordable public transportation rather than punishing everyone with higher gas prices. Heck, I’d visit Zion National Park, Springdale, and other “touristy” communities a lot more if I could hop on a bus from St. George to Zion. “If the tax doesn’t happen soon locally, eventually the federal and state governments will step in and do it the way they would like, Tervort further said.” ???????????? THIS has got to be one of the dumbest statements I’ve read in a very long time! Just what does Tervort think is going to happen that will make the federal and state governments NOT step in and do whatever they want to do with fuel taxes? Whether this tax passes or not, is immaterial to what the “big boys” are going to do. All the passage of this tax is going to do, is to raise fuel prices that much sooner. Taxes are justified through increased costs. Increased costs are created through lack of productivity and improper procurement practices. The problem must be addressed and not an easy “fixing the symptoms” instead of the cause. Seems to me there are unlimited resources for on the Job training for trustworthy inmates at purgatory . What about able bodied welfare recipients. These cost cutting techniques may prove to be effective ways to solve a cost problem and establish self-worth in many that are doomed to self-destruction. My wages sure haven’t increased in 7 years, but local, state & fed will stop at nothing to bleed us of everything we earn. Living in a rural community, I have no choice but to commute 100 miles a day for work. These taxes are heavy to bear, and at the end of the day, they go in the same coffers as the rest of the revenue to be spent on anything, except for what it was intended. The people need a tax break, not an increase. Let the people keep their money, and they will spend it on what they need, which will help those whom they hire. That way the money helps more people. This economical rollercoaster isn’t over. Now is not the time to be raising taxes. Great article. I love that the information is presented without an overt editorial slant. Are there procedural measures that could be implemented to make road maintenance more efficient while maintaining or improving efficacy? Are there people/positions that could be cut from the process to trim cost? Probably. The ONLY thing I like about the tax is that it’s a consumption tax vs. property tax. I generally think ongoing property tax is immoral. I’d like to see some private sector-styled thinking applied to the process instead of the usual “let’s raise taxes” that comes from government agencies. Raising taxes should be the last thing we try to do, as it places a burden on the economy that instantly effects EVERYONE along supply chains of every variety, on an individual citizen level all the way to large corporations – this will increase the cost of every good and service we have to offer. I suspect that there’s enough creativity among our County Commissioners to find a better solution.